On the few occasions I’ve spoken with Canelo Alvarez, I’ve always been struck by the man’s professionalism. That may seem like on odd thing to read in lieu of recent positive drug tests, but Canelo comes across to me like an adult. Not someone at a loss for words. Not a caricature. Not a person quick to insult or overly eager to please. An adult. His responses to my queries have always been polite and to the point. It’s something that’s stood out to me about the guy for quite some time now. I bring this up because the very adult personality and professionalism Canelo’s exuded have made the man somewhat ill prepared for what has transpired during the last year. Like everyone else, I have no idea whether or not Canelo intentionally consumed clenbuterol, the banned substance he tested positive for last winter. If he did, that makes the professionalism he has exuded false. No one really knows the truth, though, so we’re left with a personality that seems ill equipped for the matter at hand. 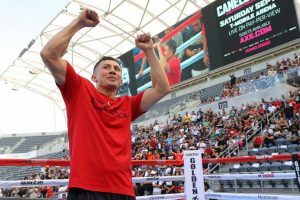 The fact that Canelo was less than quick to address the public on the matter of positive tests, then was openly hostile to Gennady Golovkin (who he’ll face this Saturday night in Vegas) for calling him a cheater makes Canelo look less than stellar. Had Canelo been fighting an Andre Ward or a Manny Pacquiao, he wouldn’t have found himself in such a position as he does now. Both men would most likely shrug at the whole sad affair, say what did or didn’t transpire with clenubterol is on team Canelo, then go about with their training. Neither man might trust Canelo from there on in, but they wouldn’t make a big deal about it publicly. That hasn’t been the case with Golovkin or his trainer Abel Sanchez, though. They either truly think Canelo has played dirty or they’re using the opportunity to get inside his read haired head. My guess is there’s real disgust at play among team Golovkin, but no matter. 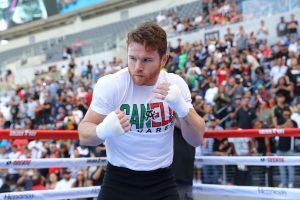 Canelo has responded to their comments and assertions by acting imperiously offended. That’s the wrong road to take. It makes sense for someone who behaves like a mature professional to be deeply troubled when his honor has been questioned, to be shaken when he isn’t taken at his word. During a 24/7 news cycle, however, the best thing would be to brush it off and focus on the fight at hand. “You think I cheated in the first bout with Golovkin? Well, I’m being drug tested constantly now, and you’ll see how I do in the rematch. Gennady can say what he wants. The truth will come out in the ring.” That’s it. That’s all Canelo has to say. Canelo is not letting the matter go, however, and he’s making himself seem a bit childish for the first time since he’s been in the public eye. Word that he won’t shake the hand of Abel Sanchez on fight night, for instance, is silly. Even if Canelo can’t stand the guy, he should make it clear that he’s going to maintain his well known sense of decorum. It’s also a bit odd that Canelo says he’s going for the KO next weekend, essentially because of all the terrible things he’s felt team Golovkin has said. It’s great if he does go for the early stoppage perhaps, but why in the world is he parading around like the aggrieved party here? When all is said and done, Canelo still tested positive for a banned substance. Whether or not he ingested that substance intentionally is pretty much irrelevant. One can think of other fighters, say Tyson Fury, or Adrien Broner, who might peacock their way through a situation like the one Canelo is in now. Classic bullies, they might present their opponents with an attitude that reads: “I’m not saying I cheated, but if I did, what are YOU going to do about it?” Ironically, that sort of absurdity would work with a large number of fans – and perhaps a large number of the media, as well. Such behavior isn’t Canelo’s thing, however. Then again, neither is acting like a victim…at least it hasn’t seemed to be up until now. Sometimes, people just have to step back and reassert themselves. That’s true both in an out of boxing.